There is a reason that so many families come to Destin on vacation: There is an endless number of fun activities for all ages! With excellent weather, the ocean right on your doorstep, and lots of fun attractions, it can be overwhelming trying to pick the best options. Here are five fun family activities in Destin that everyone, regardless of age, will in enjoy. Destin isn’t called the “World’s Luckiest Fishing Village” for nothing. A major draw for Destin is the abundance of fishing opportunities. This is one pastime that parents, grandparents, and children alike can all enjoy. What makes fishing in Destin so appealing to kids is that there is a great chance of actually catching something. You can head to the jetties, cast off from the piers, book a deep-sea fishing excursion, or cast for redfish from a pontoon boat. Great conditions make it easy to catch fish in Destin, no matter the season. Crab Island is a top attraction in Destin, and it's not just for the adults. Kids can snorkel, make a splash in the shallow water, or grab snacks from floating vendors selling everything from ice cream to boiled peanuts. One of the most exciting attractions for kids at Crab Island is the Crab Island Water Park. With admission, kids can take on the challenging inflatable obstacle course. Slides, balance beams, and more are located right over the crystal-clear water, and they are a hit with children. A unique activity that is definitely 100 percent Floridian is holding an alligator. While no one should go up and grab one in the wild, it is possible to hold and take photos with young alligators in Destin. The best place to do so is at Fudpucker's, a local favorite in Destin. Fudpucker's is a bar and restaurant, and it is also home to Gator Beach in Destin. At Gator Beach, customers can see and even feed alligators. There's also a gator museum where you can learn more about the local ecosystem and see a true albino alligator. All of this, and you can dig into some delicious food at the same time! There are water theme parks in Destin, but it is hard to compete with a private waterslide on your very own pontoon rental boat. For some lucky kids, endless runs down a water-powered slide will be the highlight of a trip to Destin. 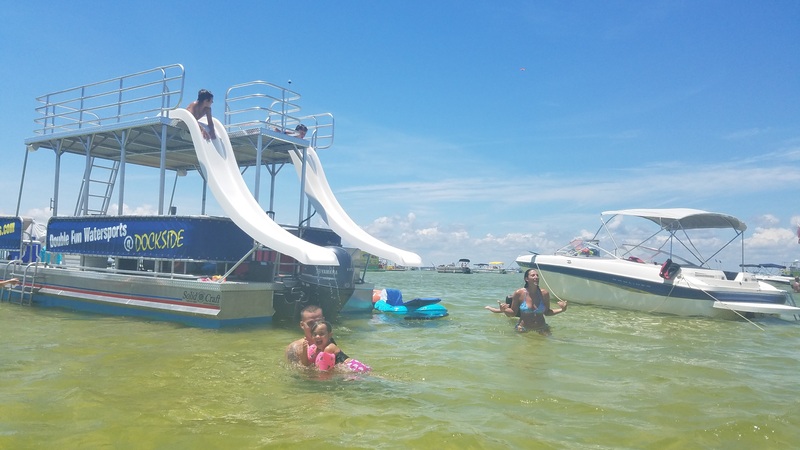 The best Destin double-decker pontoon boats have two slides that extend right off the top deck. When the boat is anchored safely, the slide can be powered by water. This is a fun rush of adrenaline for kids, but there are plenty of adults who find the slide a great time too. Dolphins inspire a kind of childlike wonder in all of us, but when children spot dolphins in the wild it can be a truly magical experience. In Destin, you don't have to go to an aquarium to spot a dolphin. In fact, you can do it right from your boat. A rented pontoon boat is the ultimate vessel for spotting dolphins. The local bottlenose dolphins travel in pods, and they are frequently spotted by the Destin jetties, near the Destin Pass, and throughout Choctawhatchee Bay. Clearly, there is no shortage of fun family activities available in Destin, Florida. Double Fun Watersports can help you have the family vacation of a lifetime with double-decker pontoon boat rentals that all ages will enjoy. The 2017 season has kicked off and we’ve got new double-decker pontoon boats to help you create the perfect day in Destin.